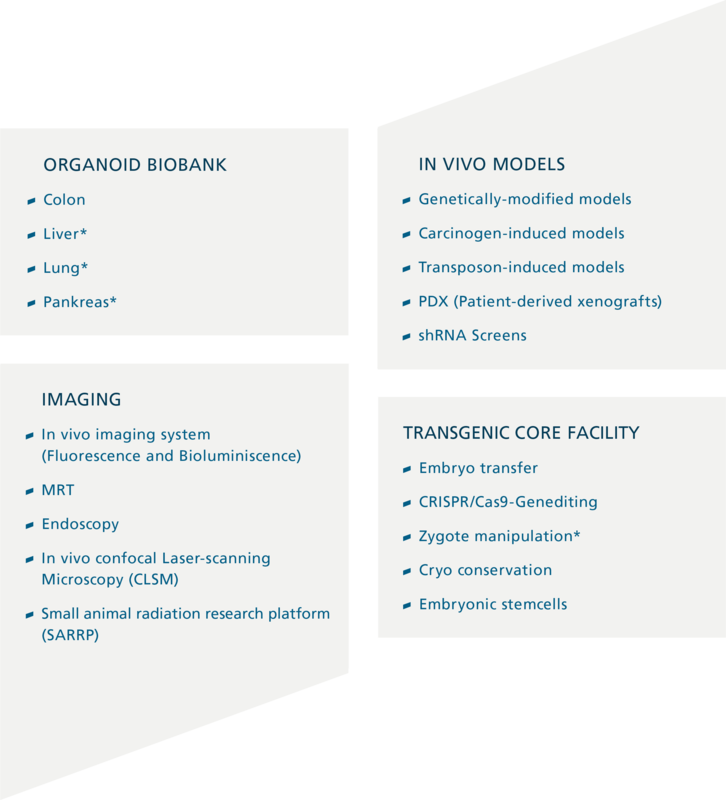 Thus, Research area 3 focuses on the development and application of patient-derived tumor models (PDX), new techniques for cultivating tumor cells in three-dimensional structures (organoid cultures) and the use of relevant genetically defined mouse models. The close integration with the Biobank of the University Cancer Center (UCT) makes it possible to investigate the expected effects on the patient at an early stage and to obtain decisive information for further development. With the help of targeted CRISPR / Cas9-mediated gene editing, mutations can be induced in primary tumor material, genome-wide screening studies can be performed, and immunocompetent mouse models with patient-specific mutations can be developed in a short time. Research area 3 profits from extensive resources that were set up by the Georg Speyer Haus (GSH) and the University Hospital. At GSH, there is a comprehensive organoid biobank for colon carcinomas, which aims to establish non-transformed colon organoids, tumor organoids, and the corresponding tumor-associated fibroblast lines from each patient. Organoids as well as tumor tissues are molecularly extensively characterized, both at the level of transcriptome and proteome. The Organoid-Biobank will be expanded towards further entities. At present, collecting and processing hepatocellular carcinoma samples has been started, pancreatic and lung carcinoma are following in the pipeline. The close interaction with the tumor biobank at UCT permits anticipation of treatment effects on patients at an early stage and to obtain decisive information for further development. In addition, numerous new mouse models are established and further developed at GSH, which very well reflect the complex pathology of human tumors (PDX models). In this context, the diagnostic options for small animals have been significantly expanded, so tumor-bearing mice can be examined by means of bioluminescence, magnetic resonance imaging, mini-endoscopy and in vivo confocal laser scanning microscopy (CLSM). Corresponding tumor models can also be applied to multimodal therapeutic approaches using the recently established CT-supported small animal irradiation facility. Research Area 3 is led by FCI-Speaker Florian Greten, who as director of the Georg Speyer Haus strongly promoted the strategic investment in preclinical tumor models. This area is strengthened in the FCI by a Staff Scientist and a technical assistance, who attend to the cooperative projects and establish the contact between the existing technologies and the FCI projects.